A non-descript muddy street leads straight into the Abdullah Nursery. There are no mustachioed, baton-wielding security guards; forget a gate, there is not even a barbed fence. You drive straight into the nursery where red plastic chairs and an old table await you. The sun is sharp and I scurry under the prized tree for a little shade. I perch myself on a gravel pathway, sip on the cola, soak all the information and let hedge-sparrows flirt with the breeze. Within minutes there are other Khans being kind and spewing information - how angry parrots peck the fruits, how naughty squirrels fatten every summer on mango juice and how the bhoonga insect is any orchard's most frightening nemesis. There is something very supercilious about Malihabad. You might call it conceit, but it really has no identity crisis; it has no uncertainty about its reputation. It is the mango capital of the country, within its 20 sq. km. radius grows about 700 varieties of mangoes that fetch roughly Rs 150 crores each season. Here you don't need to be beatified as an orchardist, everyone is born with a definite occupation - Thou shalt own an orchard! Ask anyone what makes it so special and the inevitable answer is: Mitti ka masla hai (it is all about the soil). So puffed up is its confidence that its most famous mango grower once got a letter from Jeddah that only had Kaleemullah Khan, Malihabad, India, on the envelope. It is also all in a family. In Malihabad the same blood seems to run in everyone's veins; the blood of an Afridi Afghan called Fakir Mohammad Khan Sahib Goya who married 11 times and had 52 children. Not just the blood, all of Malihabad shares the same aroma too, on its street waft the whiff of mangoes - lush, luscious and blessed. They say a pilgrim's path is always strewn with perplexities. And so truly said. If you are a mango aficionado on a pilgrimage to Malihabad, carry a little forgiveness for the terribly rutted and mucky 35 kms from Lucknow. If you don't roll the car windows up, you might soon look like a sack of Fuller's Earth and if you don't fasten the seat belt, a bone or two might just fall off. Add to all this, the beyond 42 degree Celsius heat. Stack water, patience and like me, if you are a stranger to Malihabad, stop anywhere and just ask for Haji Kaleemullah Khan or Abdullah Nursery. That's where the mango narrative can begin and end and there would be no missing links. A non-descript muddy street leads straight into the Abdullah Nursery. There are no mustachioed, baton-wielding security guards; forget a gate, there is not even a barbed fence. You drive straight into the nursery where red plastic chairs and an old table await you. There's Afsak Ahmed too, a friend who also runs errands for Kaleemullah Khan. Khan is not there, but before you blink Ahmed scampers on his rickety bicycle and returns with chilled cola. Meanwhile, Nazmi, Khan's son, is already showing the family's prized possession - the 90-year old tree on which grows 300 different varieties of mango. The sun is sharp and I scurry under the prized tree for a little shade. I perch myself on a gravel pathway, sip on the cola, soak all the information and let hedge-sparrows flirt with the breeze. Within minutes there are other Khans being kind and spewing information - how angry parrots peck the fruits, how naughty squirrels fatten every summer on mango juice and how the bhoonga insect is any orchard's most frightening nemesis. There were stories about how Khan's home was laden with trophies and citations. Shoaib Khan, Khan's nephew, is worried about the heat and takes us to Khan's home where the shelves are literally burdened with trophies and shields. A few minutes later Kaleemullah Khan walks in. The first thing you notice is his genial smile and good looks; the next he mesmerizes you with his mango tales and his metaphors about how mangoes are like human beings, each mango has innate virtues. Khan inherited the 20 acres of mango plantation from his father Abdullah Khan and years ago started experimenting with crops and breeds. On one tree he has nurtured 300 varieties of mangoes and that feat garnered him a place in the Limca Book of Records. He also refused an offer by the Iranian government to settle in Iran and do what he loves - grow mangoes. Khan is not willing to leave Malihabad, it is his love; it is his fiefdom. Perhaps experimentation and an attractive smile are genetic with the Khans. 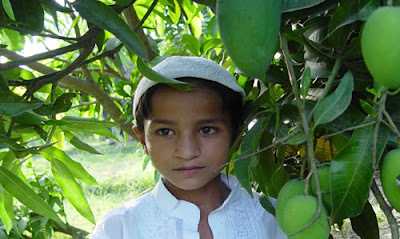 Kaleemullah's younger brother Hamidullah who owns nearly 50 acres of mango orchards has slogged seven years to develop a late variety of mango that would yield fruits even in winter. Hamidullah has not christened the tree yet, but he dreams of a day when people would shiver by the fireplace and eat his special variety of mango in December. Like the elder Khan, he too smiles beatifically. Ask any mango purist from the North to choose one variety and he would invariably pick the Dussehri. It has dark flesh and takes its name from Dussheri, a small village about 25 kms from Lucknow. The village's claim to fame is the original 300-year old Dussheri tree which some would have us believe was not planted by humans; it rose from the earth as a blessing. For centuries the tree has been the property of the Nawab of Lucknow and even now the fruits of this tree are picked and sent to the Begum who also owns the palatial Dussheri House. They are never sold in the market. This summer the tree was laden with at least 1,000 kgs of gorgeous fruits. There's more to the mango narrative than spraying insecticide and plucking the fruits. Much before the fruits ripen, the orchards are auctioned. I sat through an auction of 200 trees that began with a bid of Rs 50,000 and ended at Rs 1.33 lakh. Not for them the gavels on a mahogany lectern, the bids are screamed by a man whose decibel level can demolish a weak roof. He perhaps ends up with a sore throat every night because every day he screams for nearly 10 orchards and gets paid anywhere between Rs 200-500 per deal. Then there are the peti (box) makers, who buy mango timber for nearly Rs 100 a quintal, out of which they carve 10-15 petis, selling each for Rs 8-10. The carpenter who hammers 50 nails in each peti gets paid only 50 paise for the work! Sikander whose family has been in the business for three generations informs that each season they make about 15,000 boxes. Once the mangoes are packed, transporters like Kamaal Khan 'Guddu' rev their trucks and take the famous Malihabadi mangoes to various mandis, including Azadpur in Delhi. Guddu alone ferries nearly 100 trucks to Delhi; he is not the only one, there are 20 other transporters from Malihabad. It is after so much fuss that the mango finally lands on your dinner plate. Imagine that! If you want to see Malihabad in its magnificence, go there between June 10 and 20. That's when the mangoes wear their fineries, scatter their scent and sway elegantly in the breeze. You might call it conceit; I would call it the closest approximation to ecstasy. Published in Swagat magazine, June 2005.
presently this website is under construction, but within a week just see the quality content on this website.